A couple of years ago I posted a recipe for Ravioli Nudi (sometimes called Gnudi or Spinach & Ricotta Gnocchi). As delicious as they are, they are not something that I would typically be inclined to make on short notice... Making them is a bit of a project and they are special occasion fare (at least in my world they are...perhaps an Italian might feel differently). Plain ricotta gnocchi (a close cousin of ravioli nudi) are another matter. As long as you remember to drain the ricotta 12 to 24 hours ahead of time, these delicious little dumplings can come together very quickly. If you have never made gnocchi of any kind (varieties abound), these would be a great place to start. As with the gnudi, the goal when making the dough for the ricotta gnocchi is to add as little flour as is necessary to make a dough that can be handled. If your main ingredient (greens... or cheese....) is wet, you will need to add more flour to make this possible. The more flour you add, the denser and heavier the gnocchi will be (not what you want). Hence, the necessity of thoroughly drying the greens (for the gnudi) and draining the ricotta of excess whey (for both the gnudi and the ricotta gnocchi). As long as you remember that the idea is to make fluffy pillows of well seasoned ricotta—and that the flour and egg are just structural background players—you should have good success with your gnocchi. Simply season the cheese (salt, Parmesan, a little olive oil), beat in the egg and then work in the flour with brief, deft movements. Overworking will create tough dumplings. Forming the ricotta gnocchi is also comparatively easy. Just divide the dough into manageable lumps, flour the work surface very lightly, roll into even (about 1/2-inch in diameter) ropes and cut cross-wise into uniform (a scant 1-inch) lengths. You can stop at this point and you will have ricotta gnocchi. Because I have been making potato gnocchi for many years (I'm not sure why I have never written a post...)—and I love the look of the grooves and indentations (not to mention the way they hold the sauce) of traditional potato gnocchi—I go one step further and roll the little cylinders of dough off the tines of a fork. 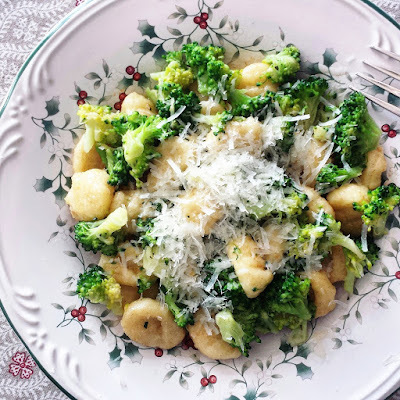 I have given instruction for how to do this in the recipe, but please don't feel like you are not making true ricotta gnocchi if you don't execute this extra step. 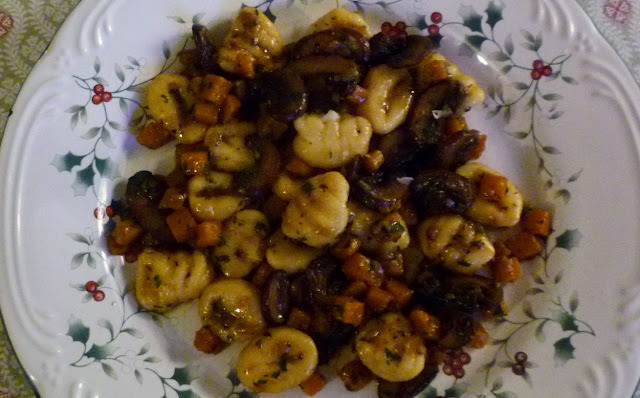 Ricotta gnocchi are very versatile and may be sauced in numerous ways. 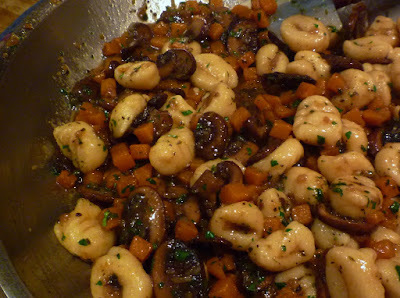 I am including a recipe for a rich ragout of butternut squash and mushrooms (similar to one I posted for pasta a few years ago)—but this sauce is actually sort of complex as far as sauces for gnocchi go. Most of the time they are sauced simply: A basic tomato sauce... or a light cream sauce... or an herbaceous pesto of some kind... or nothing but butter and Parmesan. Any simple pasta sauce will work well. They can also be floated in a richly flavored clear broth ("in brodo")... alone, or with a few fresh vegetables. And like other styles of gnocchi, they are excellent when cooked, cooled and given a quick sauté in a bit of butter. No matter how you sauce them, I think you will find them to be delicious. Place the ricotta in a bowl with the olive oil and salt. Beat until smooth (some ricotta has prominent curds and you want the ricotta to be smooth) and starting to get fluffy. Add the Parmesan and beat in. Beat in half of the egg and the yolk (save the remaining half egg). Place half of the flour onto a clean counter and turn the ricotta mixture out onto the flour. Sprinkle half of the remaining flour over the mound of ricotta. With a bench scraper, cut the flour into the ricotta mixture just until it has disappeared and the dough begins to come together, adding as much of the remaining flour as is necessary to form a soft, slightly springy dough. The dough may be tacky to the touch, but it shouldn't stick to your fingers. Test the dough for seasoning and structure by pinching off a 1-inch by 1/2-inch piece and dropping it into a pan of simmering salted water and cooking for a minute after it floats to the surface. If it falls apart, work in some of the reserved egg and if necessary more flour and test again. Taste and correct the salt if necessary. Cut the finished dough into six pieces. On a lightly floured surface, roll each piece out into a long rope that is about a half inch in diameter and about 20 inches long. Dust the work surface and the ropes with semolina and using a bench scraper, cut the ropes crosswise into 1 inch pieces. To finish shaping, place one of the cut surfaces of the gnocchi on a semolina-dusted fork and with your thumb (floured if necessary) press the other cut surface down and away from yourself, rolling the gnocchi off of the fork as you do. You should end up with a dumpling that has the marks of the fork on one side and a dimple from your thumb on the other. Place the gnocchi onto a semolina dusted sheet pan as you form them. 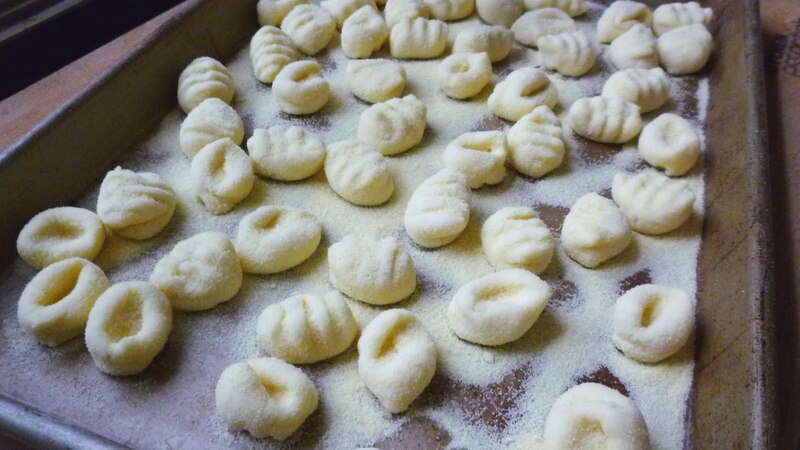 The gnocchi may be held at a cool room temperature or uncovered in the refrigerator, for a few hours. They may also be frozen at this point (see notes). To cook the gnocchi, bring a large pot of well-salted water to a simmer (a hard boil will encourage the gnocchi to disintegrate). Add the gnocchi. Carefully stir or gently slide the pan back and forth to make sure the gnocchi aren't sticking to the bottom. Monitor the pot to make sure a gentle simmer is maintained. The gnocchi will begin to bob to the surface. Continue to cook for 1 minute after they float to the surface. (They are done when they feel slightly springy—rather than squishy—to the touch.) Lift the gnocchi out of the water with a mesh strainer and place in a wide dish with a few tablespoons of olive oil. Toss to coat. Serve immediately dressed with your favorite sauce or set aside for up to an hour. Reheat in the sauce the gnocchi will be served in. Makes about 120 gnocchi (possibly more, depending on how thick you make your ropes and how wide you make your cuts), serving 4 to 6. Most commercially available ricotta is wet. You will probably be able to pour some of the water off when you open the container. Even if it looks firm and dry, I always place it in a paper towel-lined sieve and suspend it over a bowl to let it drain overnight (in the fridge). Often there will be no liquid in the bowl, but the paper towel will be saturated. If you don't drain the ricotta, you may need to add more flour to the dough, which can make the gnocchi stodgy and tough. 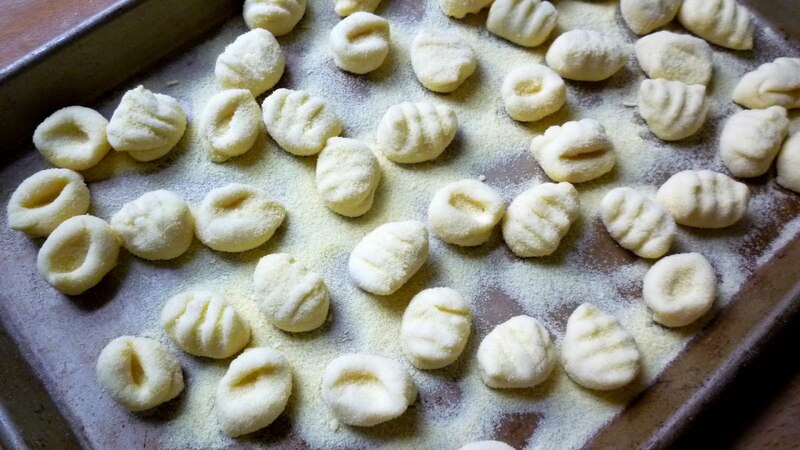 To freeze the gnocchi, place them in the freezer in a single layer on a semolina dusted sheet pan. When the gnocchi are hard, transfer them to a freezer bag. 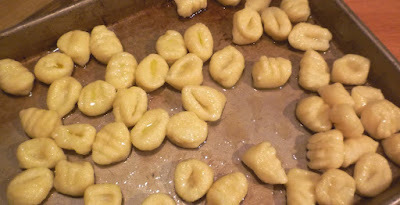 To cook, spread the frozen gnocchi on a sheet pan (with some of the semolina from the bag, or fresh semolina) and let them sit uncovered at room temperature to thaw. This should take about 15 to 20 minutes. Cook as for fresh. Recipe is easily halved or multiplied. If you do not have a large stock pot, poach the gnocchi in two batches. Warm the olive oil in a large sauté pan (large enough to hold the squash in a snug single layer) set over medium high to high heat. When the oil is hot (you should see a thin wisp of smoke), swirl in a tablespoon of butter. When it foams, add the mushrooms. Toss to coat the mushrooms in the fat and then leave the pan alone to allow the mushrooms to begin to brown. When the edges are beginning to brown, give the mushrooms a toss/stir, season with a good pinch of salt and scatter half of the thyme and rosemary over all. Continue to sauté, stirring occasionally and regulating the heat as necessary to maintain a very active sizzle without allowing the mushrooms to scorch, until the mushrooms are browned and tender—about 4 to 5 minutes total. If the mushrooms seem dry at any point, add another half tablespoon or so of butter. Transfer the mushrooms to a plate and return the pan to the heat. Add three tablespoons of butter to the pan. When it melts and foams, add the squash along with a pinch of salt and the remaining thyme and rosemary. Sauté, regulating the heat to maintain the activity in the pan and cooking until the squash is beginning to caramelize nicely—about 5 to 7 minutes. Add another tablespoon of butter to the pan. When it is melted, add the shallots, along with a pinch of salt. When the shallots have softened (about 3 minutes), return the mushrooms to the pan and add the stock. The stock should come up almost to the top of the vegetables—add more if the vegetables aren't almost covered. Taste and season with salt and pepper. Cook at a bare simmer (uncovered and stirring every now and then) until the squash is just tender—about 20 minutes after adding the stock. As the liquid reduces, add hot water and continue to cook. You should maintain a level of liquid in the pan that comes 2/3 to 3/4 of the way up the vegetables. When the squash is tender, add the gnocchi and parsley. Toss to coat. If the gnocchi have cooled since cooking, gently heat through. Taste and correct the seasoning. If the sauce seems tight, add more warm water...or you may use the water the gnocchi were cooked in (taking into consideration that this water is well salted). Divide the gnocchi and sauce among warm plates or shallow pasta bowls and serve immediately. Serves 4 to 5.